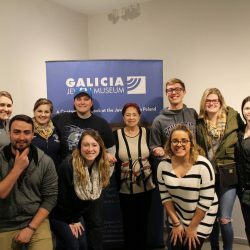 Students from Penn State Berks entered Auschwitz as curious scholars and left with a greater appreciation for the horrors of war, and in particular, the Holocaust. This year, the Penn State Berks Alternative Spring Break program took a group of seven students and two staff advisers to Kraków and Oswiecim, Poland, where they spent time focusing on remembrance and preservation efforts at the Auschwitz Museum Collection Department from March 4-11, 2017. The group visited Auschwitz I and Auschwitz II (Birkenau), and toured historic sites in Kraków and Oswiecim. When asked what sites impacted them the most, junior Stephen Speer recounted their visit to the Old Synagogue in Kazimierz, one of the most ancient Jewish places of worship in Europe. The 16th-century brick synagogue was a central part of life of the former Jewish quarter in Kazimierz, once Krakow’s rival city and now one of its downtown districts. It was preserved after the Holocaust as a museum. Savanna Brown, a first-year student, talked about walking through a meadow near Auschwitz-Birkenau and thinking how peaceful it looked. When their tour guide told them that the meadow was full of the ashes of prisoners who were cremated, the peaceful image took on a whole different meaning. Participating students chose the type of work they wanted to do for Alternative Spring Break without knowing the location, according to Betsy Scarpaci, Assistant Director for Residence Life. Based on the consensus of the group, the option to travel to Poland and work on preservation efforts at Auschwitz was selected. Auschwitz concentration camp was established in the suburbs of Oswiecim as part of the Holocaust–the genocide of the Jewish people committed by the Nazi Party in Germany from 1939-1945. Adolf Hitler, Germany’s leader at the time, led the Nazi regime in the execution of primarily Jewish individuals, as well as those who were gypsy, homosexual, physically disabled, and politically opposed to Hitler’s views. Approximately six million people were executed during the Holocaust. The most infamous of the concentration camps was Auschwitz-Birkenau, which also had the distinction of being the largest of the death camps. The students worked in partnership with the nonprofit organization Amizade on initiatives related to social justice and service learning. At the Auschwitz Museum Collection Department, they were split into two groups: one worked on transporting detailed authentic replicas of the suitcases that prisoners brought with them to Auschwitz. The other worked to preserve old limestones, which were used in the creation of Nazi training manuals. Penn State Berks student participants in the Alternative Spring Break included senior Juliette Piersody from Wernersville, Pennsylvania; juniors Marissa Catteau, Elizabeth City, North Carolina; Kaishla Gonzalez, Temple, Pennsylvania; Chelsea Watts, Geigertown, Pennsylvania; and Stephen Speer, Fairless Hills, Pennsylvania; sophomore Julienne Munson, Fleetwood, Pennsylvania; and first-year student Savanna Brown, Philadelphia. The students were also impressed by the artwork that they saw at Auchwitz. They visited an exhibition of 110 prisoner portraits, as well as the renowned artwork of Marian Kolodziej, a member of one of the first transports to enter Auschwitz, where he remained a prisoner from age 17–23. After the Holocaust, he did not speak of his experience for 50 years. Then after a serious stroke in 1993, he began rehabilitation by creating pen and ink drawings depicting the experiences he endured in the concentration camp, resulting in more than 300 drawings of prisoners with skeletal bodies but individual faces. Today, his work is located in a permanent exhibition in the lower level of the Church of the St. Maximilian Kolbe Centre at the Franciscan monastery near Oswiecim. In addition to their travels, the students were enrolled in the hybrid course “Alternative Spring Break: Oswiecim and Krakow, Poland,” which focused on the history and culture of Poland in relation to other nations around the world. The course topics include leadership, human rights, food security, and power dynamics, among others. The Alternative Spring Break was organized by Autumn Fritz, Assistant Director of Community Development, and Betsy Scarpaci, Assistant Director of Residence Life. Funding was provided, in part, through the Student Activity Fee and The Howard O. and Jean Beaver Endowment for Community Service. Students also held multiple fundraising events throughout the year. For additional information, visit the Berks Alternative Spring Break blog at sites.psu.edu/BerksinPoland.